Webmaster's Note - 15/06/03: "Recfish Australia’s mission is to represent the interests of recreational and sport fishers at a national level to ensure quality fishing. We seek your support in promoting the voluntary National "
Rare Mouse Found in the Border Ranges National Park. ED Note: July 8, 2018. Please note that some personnel details are no longer current. Photos © courtesy of Nolene & Bob Harris. Vigilance on the part of the 17 volunteer observers has brought a handsome reward this year. On Saturday the 14th of November they met for a field trip with NSW National Parks and Wildlife Service Ranger Bob Moffat and group leader Andy Reimanis. Each team or individual observer submitted their observation report sheets for compilation, and the results have now been released. Over the season 21 nest sites were observed on a regular basis. Twenty osprey pairs attempted breeding, and though two nests were destroyed by wind or collapse of supporting branches, a record 22 young osprey were probably fledged! Ospreys face many natural perils as well as perils initiated by humans, so this is indeed a great result. One nest succeeded in spite of sugar cane being burnt directly beneath it, and another tolerated the interference of an observation mirror being attached, possibly by a developer's consultant, and removed by NPWS officers. A banding program by NPWS officers was probably instrumental in saving the lives of two chicks which became fouled by fishing tackle brought to the nest with their food. The resilience of this species is truly remarkable. It is beginning to look like their decline in this area was largely due to lack of suitable nesting sites. 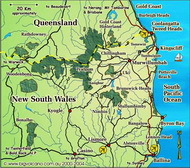 What is also remarkable is the incredible fish productivity of the Tweed River and estuary. Not only does it support an abundance of Ospreys but equally impressive populations of Sea Eagles, Brahminy Kites, Whistling Kites, pelicans and the ubiquitous shags and cormorants. Congratulations to Bob Moffat, Andy Reimanis and all the volunteers. A banding operation for osprey nesting early this spring, might well have been the salvation of a pair of nestlings. 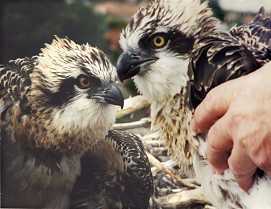 In late August the NSW National Parks and Wildlife Service, as part of its annual Osprey survey, was carrying out banding of chicks in several nests in the Wollumbin area. In one nest they found two nearly fledged juveniles which had become seriously fouled with fishing lines, leaders, swivels and hooks. One chick had both wings and legs fouled by fishing line and the other had swallowed a stainless steel hook, still attached by a leader, to a brass swivel which was hanging out of the corner of its mouth. X-ray courtesy of Alstonville Veterinary Clinic. NPWS ranger Bob Moffat, who is based at Alstonville, said that one of the young fish hawks was freed from fishing line and immediately tagged and returned to its nest. 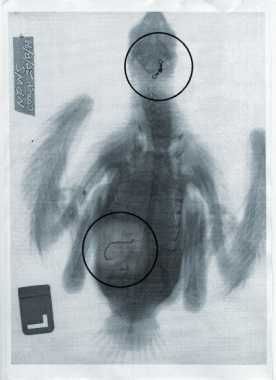 The other was taken to the Alstonville veterinary clinic where an x-ray showed a fish hook deep in its stomach. Evan Kovac, the veterinarian, administered an emulsion which fortunately induced the young bird to regurgitate the hook overnight. If the hook had been caught in the chick's gut it might have required major surgery to remove it. The second youngster was banded and returned to the care of its anxious parents the next day. Mr. Moffat said that as the birds had never left the nest, the line and tackle must have been delivered to them by their parents attached to, or even inside fish the adult birds had caught. He appeals to anglers to recover all possible tackle and waste line, and to never use stainless steel hooks or tackle. Mild steel tackle rust away quite quickly especially in salt water or the acid conditions inside the gut. Over the past ten years, Mr Moffat has been instrumental in establishing a network of artificial nesting poles for the osprey, in co-operation with the local electricity supply company, Northpower. In spite of such hazards as described here, the endangered ospreys are now using approximately 90 nesting sites in New South Wales, a great improvement on the 10 breeding pairs known in the late 1970's. This Osprey chick is lucky to be alive after having swallowed a stainless steel fishhook. TWEED fishermen have been urged to help protect the Tweed's ten pairs of Osprey - an endangered species - by taking better care of their fishing tackle. The call from National Parks and Wildlife Service officers was made last week after they discovered two Osprey chicks entangled in fishing line. 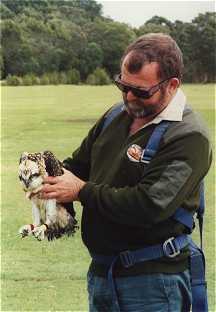 The discovery was made during a banding operation which involves inspection of Osprey nesting poles. "One had a piece of fishing line coming out of its throat and this was wrapped around another chick's neck," NPWS ranger Dwayne Binge told the Tweed Link. Mr Binge advised fishermen against using stainless steel hooks as these do not break down in salt water, or in the stomach acid of fish or birds, like ordinary hooks. He also suggested fishermen use fishing line that breaks down in ultraviolet light. 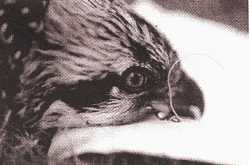 "Ospreys are an endangered species. We have quite a few of them in the Tweed - 10 breeding pairs - and we need to protect them," he said. Tweed's river management co-ordinator Jane Lofthouse last week said discarded fishing line was a major problem for sea birds. She encouraged fishermen to recover tackle whenever possible and to thoughtfully dispose of fishing line. Osprey illustration © from Simpson & Day Field Guide 1998.